Scott Adams, genius creator of the enormously popular Dilbert comic strip series, believes there are six elements of humor: naughty, clever, cute, bizarre, mean, and recognizable. He says you need at least two of these elements to succeed, so let's think about Calvin and Hobbes as an example. They get so many of those elements right away: a cute kid with a bizarre talking tiger say clever things and get into mischief. How many of those boxes could you check off when your little one sports this adorable polka dot mouse costume? The cuteness is inherent, so the naughty, clever, and bizarre, we guess, are left up to you and your little princess to add. Hit a couple of those marks and, who knows, she could be the life of the costume party or the light of a dark trick-or-treating jaunt. Next to a bunch of spooky ghosts, she might somehow look even cuter than before. At the doorstep of your neighbors' place, she'll be a sight for sore eyes currently reeling at the horde of zombies out and about. This Toddler Miss Mouse Costume—complete with foam mouse ears, a red fabric bow, and a velvet-covered headband—is as much a treat for her as it is for everyone around! Pair it with a frilly petticoat and a pair of shiny Mary Jane shoes to achieve a cuteness overload! At the doorstep of your neighbors' place, she'll be a sight for sore eyes currently reeling at the horde of zombies out and about. This Toddler Miss Mouse Costume—complete with foam mouse ears, a red fabric bow, and a velvet-covered headband—is as much a treat for her as it is for everyone around! 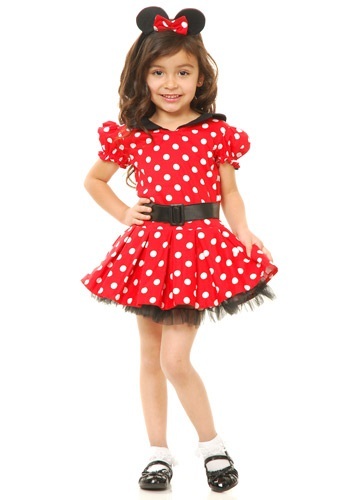 Pair it with a frilly petticoat and she'll have a blast spinning around in the polka dot dress with its black collar. Add a pair of shiny Mary Jane shoes to achieve a cuteness overload!